Google AdSense is nowadays one of the most popular ways to earn money online. It's easy to set it up and easy to use. Well, it actually works for you. Basically it works like that. Google offers you to put other websites ad's to your websites and when someone on your website clicks on the ad you earn some cents from it. If you have about 1000 visitors a day on your website you can easily earn about $5-$10 just from those ad clicks. The amount you earn from a lick depends on the value of ad, every different ad niche makes you different amount of money. The rarer the niche is, the more you probably earn from a click on this niche ad. AdSense is kind of easy to setup. You have to login to your Google account, open AdSense homepage, choose the size of the ad, colors of the ad and then you'll get the HTML code that you can put on your homepage or blog. You can use AdSense in every kind of website, it doesn't matter if it's Wordpress based, Blogger or something different. It's problably hard to make a living with Google AdSense only, but it certainly is a great way to earn some extra money for example Christmas or different holiday gifts. Sharecash is another easy way to earn money.Well, not so easy if you don't work on it, but a few hours of hard work a day and you could earn quite a big bunch of money. Basically it works like that: you upload something to their website and whenever people download it, you get 20 to 60 cents per download. Imagine for a minute that 1000 people a day downloads something you have uploaded to their site and well 40 cents is the average amount you get per download. 1000 x 40= 40000 cents, which is $400. That's a quite good amount of money for a day, isn't it? That's $12000 a month. WOW! And that's only for one file. 10 files with same amount of downloads makes $120000 a month. Of course it may sound easy. You upload something to their website and now money starts flowing in. Nope. Not so easy. The hardest thing to do is to advertisee the thing that you want people to download. Easiest places to advertise it are Facebook and Twitter of course and maybe Youtube. But if you're looking for some big money then you should make one high rank website which has a lot of traffic coming in and put the link out there but well, that's just a thought. I haven't dealt with Sharecash a lot myself, but I have some good friends who has, and quite well actually. Anyway, if you want to find out more about Sharecash then don't forget to check out their website yourself. Fiverr has been on the internet for a few years now. This place itself offers people to offer their services for $5. You can offer absolutely everything! Starting from dancing as a banana and ending with voice recording. I truly mean everything. Basically you make a gig with headline, description, tags and you add some images (max. 3) to describe the gig even better. Then your gig will be uploaded to Fiverr search engines, so if someone searches some tag which your gig has too he may find precisely your gig. So now, if he will order from you then he has to send over the information about the order and you, of course, have to complete the order. If he's not satisfied with the service then he may ask you for revisions, otherwise he may simply give you a negative rating. But of course It's better to try to satisfy all the customers and keep your ratings positive because this way you have a bigger possibility to get higher rankings in Fiverr search engine and that, of course, drives more traffic to your gig which results more orders. Also there is one more thing. 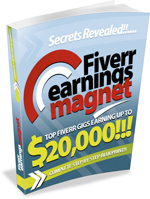 Fiverr takes $1 per every order. So per one order you get $4, not $5. Yes, seller pays $5, but you get only $4. This is problably the only negative side of the Fiverr. Well, actually that's not the only negative side. Of course there are also some really demanding customers who simply want too much, but luckily most of the customers are quite friendly and understand how much they can get for $5.